Lock in a great price for Sleepy Station – rated 8.9 by recent guests! 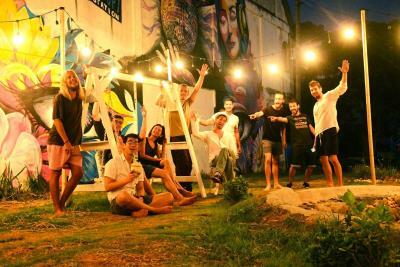 Sleepy Station hostel is one of the best hostel in kata beach. Staff is really nice and helpful. Facilities are nice. So relax and chill place. Great value place, spotless clean, nice communal areas and overall vibe. Owner is very friendly and helpful, capsules are quite large. Its located at a rather quiet spot so not noisy at night. 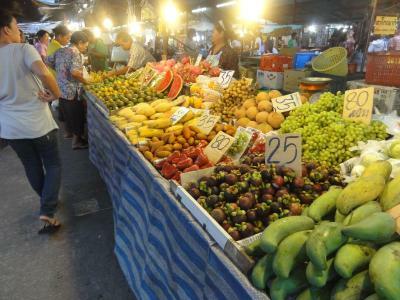 Prices of food and drinks are fair compared to overall Phuket. Wifi is stable as well. Great staff, great location and amazing price for what you get. You can be relaxed because they have a lot of CCTV cameras and the front desk is there 24/7. Everyone is super nice and helpful. 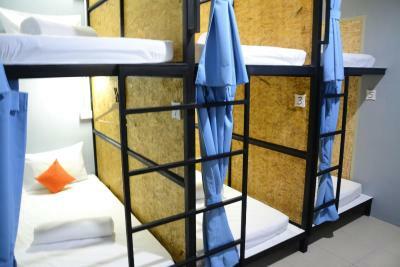 The hostel is very clean and the staff is super nice. I really enjoyed the living room with kichen and sofas. Well centred but still, in a quite area. Totally recomend it!! It had such a good vibe. Great facilities (bar, kitchen, balcony, garden, TV and loads more!) so a nice social space for meeting people. Beds were nowhere near as uncomfortable as others say, easy to get a good nights sleep, especially when beers are 40Thb! We liked it so much we are going back for a week! 5 minute walk to the beach and really helpful staff with tours and onward travel. I booked so late and they didn’t have any problem, clean, friendly staffs and good facilities! Rooms were clean and common areas were well kept and social, but also not too loud at night. Its nice they have coffee and tea for you as well as a fridge and kettle, microwave etc. Easy 15min walk to the beach with plenty of restaurants, shops, and markets around. It was better than expected!!! Staff very cool and helpful!! A big kitchen and fridge where you can put your food. Price was the best ever!!!! 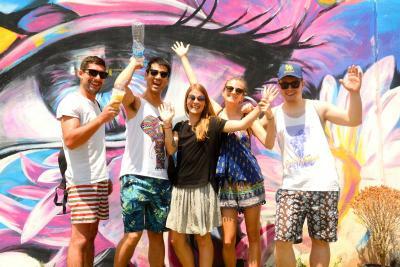 We had a great 5 days at Sleepy Station! 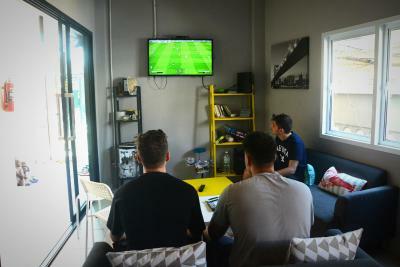 The hostel just opened so it is super clean, and the owner is eager to hear feedback and do everything he can to provide a great experience for his guests. 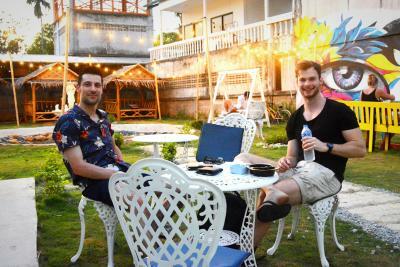 The common areas are comfortable and are a great place to hang out if you’re looking for a low-key stay in Kata beach. We would love to come back anytime. Thank you so much Moustafa! 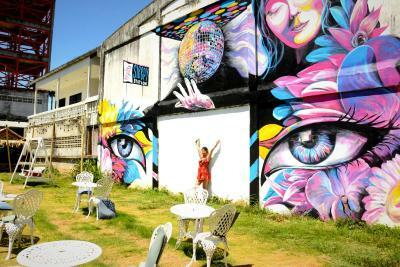 Sleepy Station is located in Kata Beach, a 14-minute walk from Dino Park Mini Golf, and has free bikes and a garden. 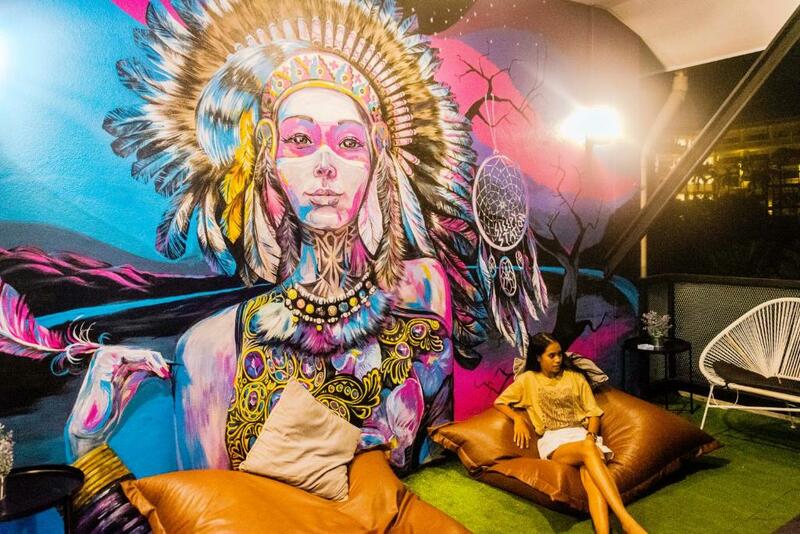 Among the facilities of this property are a restaurant, a 24-hour front desk and an ATM, along with free WiFi. 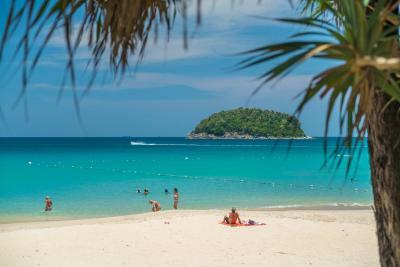 The property is half a mile from The Coffee Club Kata Beach and an 11-minute walk from SC Plaza Kata. At the hostel, every room has a terrace with a garden view. 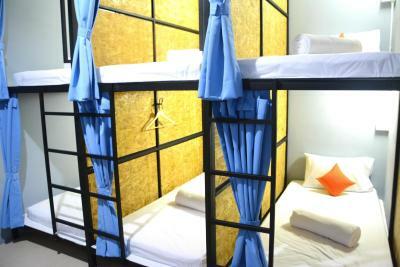 Each room is equipped with air conditioning, and certain rooms are contain a balcony. All rooms will provide guests with a toaster. The area is popular for cycling, and bike rental is available at Sleepy Station. 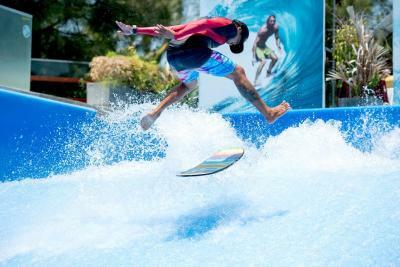 Surf House Phuket is 0.6 miles from the accommodation, while Kata View Point is 2.4 miles from the property. 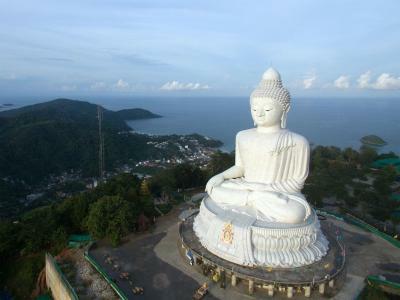 The nearest airport is Phuket Airport, 28 miles from Sleepy Station. When would you like to stay at Sleepy Station? 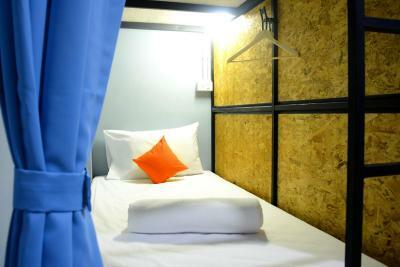 This bed in dormitory features a cable TV, air conditioning and mini-bar. House Rules Sleepy Station takes special requests – add in the next step! The smell from the drain behind our room was awful. Wished it was a little closer to the beach. Amazing staff/receptionist Nice relaxed lounge. Adorable watching the kittens play in the morning whilst having the free breakfast with coffee/Tea. Free drinking water!!!! There was not enough space in the dorm rooms for everyone’s luggage. 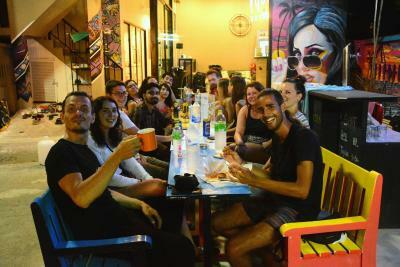 Friendly staff; we rented a motorbike and booked a boat/bus trip to krabi here. They have a lot of cosy common space to chill and relax. 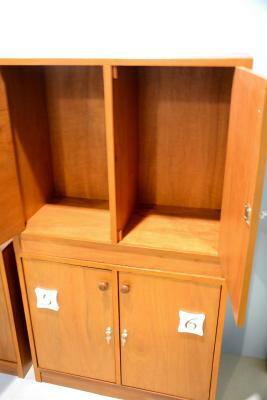 You can do laundry, watch tv, use the kitchen,... You have a locker for some personal stuff. It was clean, have private space and close to the beach. Everyone need to take off shoes , but there's no enough shoes racks provided. All shoes scattered on the floor. May be the property can improve on this matter. 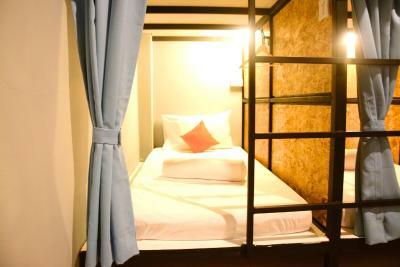 The beds are comfy and the bed cubicles are quaint and give plenty of privacy which I really like! Reading light and plug next to bed convenient. Safes for each bed and the common area is nice. Great location near the beach. I’ve stayed here many times and each time they’ve added new improvements! Would highly recommend to any traveller. Super cheap, getting so much for your money! The neighborhood is quiet so you can get a goodnight sleep there.The garden is a really good public area you can meet a lot of nice people there, and they offer you tasty breakfast and fruitshakes just for a small amount of money. The beach is a 10 minutes walk from the hostel. The walls are thin and it can get a bit noisy sometimes. Mattress was a bit hard. First of all I loved the style of the hostel! Very trendy! Location was very convenient. Walking distance to supermarket, restaurants and beach. The room and ensuite bathroom were big and had everything I needed. Staff was very helpful and nice. Its a 10 min walk to the beach but can't fault much considering the price you pay. No full length mirrors anywhere. The breakfast meny was geat. 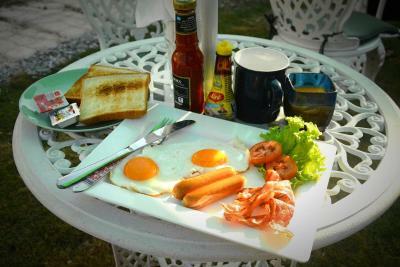 I had the American breakfast and it was good value for the money. Everything was great. 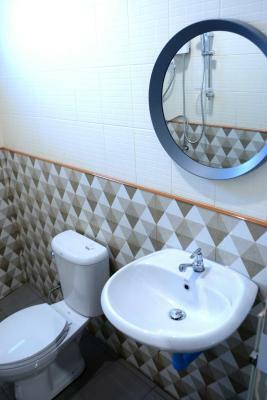 Friendly and helpful staff, comfortable bed and nice atmosphere. 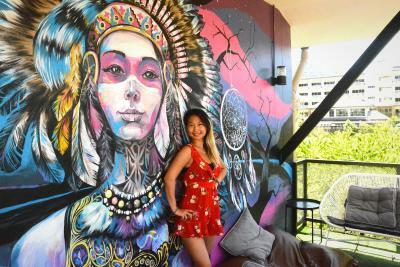 I liked common areas, especially garden) Kata beach is only 10 min walking, shops and restaraunt also very close. I will definitely come back again,thank you!